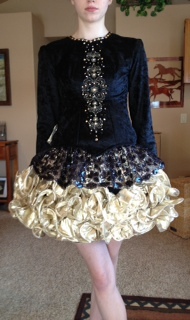 This gorgeous black and gold dress was custom made for my tall 15 year old daughter. She is 5′9″ tall with long arms and legs. The dress comes with spankies, cape and headband. 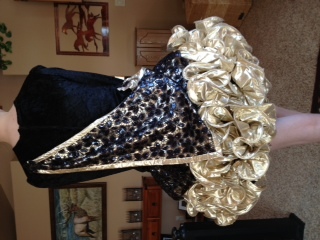 There is room for let out and because the dress is two parts, the skirt could also be adjusted. 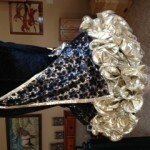 The dress is light weight and easy to dance in. 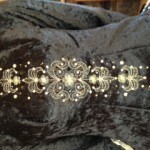 The bodice is made of crushed black velvet and the skirt is made of gold lame. 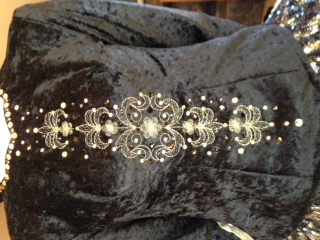 There is about 2″ of let out on each side of the bodice, and the skirt is adjustable at the waist but not in length.